Do you know how to make your vodka kosher? Well, apparently neither does the kosher liquor company that Donald Trump rented his name to. Trump Vodka, the product of yet another licensing deal under Trump's name, was founded in 2006 and distributed by a company called Drinks Americas, the Jerusalem Post reports. 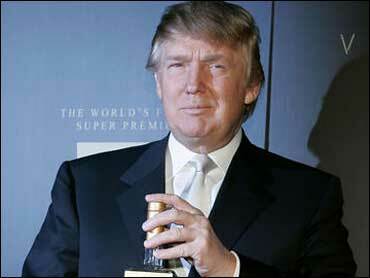 Despite the Trumpian catchphrase "Success Distilled," distribution of the drink came to an end in 2011. But when an independent importer saw an opportunity for the drink to enjoy a fruitful afterlife in Israel, Trump agreed to a new deal allowing H. Pixel International to distribute the Trump-branded booze in the Holy Land. But according to the Jerusalem Post, it turns out that some Trump Vodka was made with chametz, a leavened food product forbidden on Passover, and not made with a grain alternative, such as potatoes or molasses. Its not that Trump Vodka has been a massive hit, one employee at a liquor store in Tel Aviv told the Post, but it became a household staple for families in need of a kosher alcoholic alternative for Passover. While warnings were issued by a kosher certification organization in 2013 of the non-kosher Vodka and newly released bottles of certified-kosher Trump Vodka now bear a holographic label, non-kosher bottles are still in circulation. And to make matters even more confusing, some non-Kosher bottles produced prior to the 2013 discovery that were found to have the same identifying sticker that was put to distinguish the new "real" kosher vodka. The current guidelines: "any bottle of Trump Vodka labeled 2013 or later is only certified kosher is there is a Kashrut hologram sticker affixed to it," a Rabbi of the kosher certification organization recommended to the Jerusalem Post. The Trump campaign did not reply to a request for comment.